To make the graham cracker crust, melt the butter in the microwave or over stovetop. Mix the crumbs, melted butter, cinnamon, nutmeg and 1/4 cup sugar in a bowl. Butter the pan and then press the crumb mixture over the bottom and slightly up the sides. Chill in the fridge. Preheat the oven to 325°F while you assemble the rest of the mixture. Beat egg yolks with an electric mixture. Add sour cream, flour, salt 3/4 cup sugar and vanilla and blend well. Add the softened cream cheese (or Neufchâtel) and mix until smooth. Next beat the egg whites until foamy. Gradually mix 1/4 cup sugar into the whites. Keep going until the whites become stiff and shiny. Gently fold into the cream cheese mixture and spoon into the crust. Bake about 1 hour. To test for doneness, gently shake the cake. If the top jiggles, it needs a little more time. Remove from oven and cool. Chill overnight before serving. Add fresh fruit or a swirl of melted chocolate to the top for a delicious finish! Start by learning how to make a Basic Cheesecake, or try a Strawberry Cheesecake cheater’s version if you’re pressed for time. One note about the type of cheese you use. Most recipes will call for regular cream cheese. Just as there are hundreds of variants on making cheesecake, there are many different types of cheeses you can use. An American Neufchâtel cheese is great to use in a cheesecake. There is a difference between traditional French Neufchâtel and American Neufchâtel. American Neufchâtel cheese is very similar in texture and taste to cream cheese, but is a bit softer and moister, with 1/3 less fat than regular cream cheese. There's really no hard part to making a cheesecake. It just takes some patience. The graham cracker crust may take a few tries to get it level, but you'll quickly get the hang of it. Also, getting the egg whites to the right consistency takes some time — that's why an electric mixer will be your best friend in this adventure. All in all, while your first attempt may not go as well as planned (lumps are still delicious) the more you experiment with different cheeses and flavors, the faster you'll have this culinary favorite under your belt in no time! 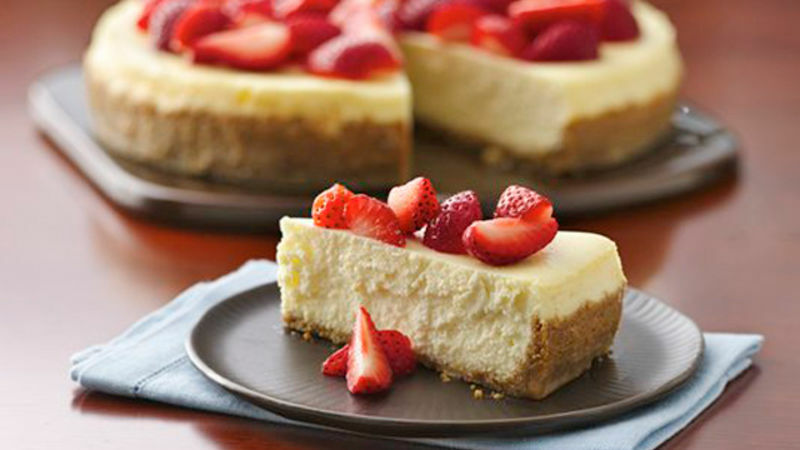 Start by learning how to make a Basic Cheesecake, or try a Strawberry Cheesecake cheater’s version if you’re pressed for time. One note about the type of cheese you use. Most recipes will call for regular cream cheese. Just as there are hundreds of variants on making cheesecake, there are many different types of cheeses you can use. An American Neufchâtel cheese is great to use in a cheesecake. There is a difference between traditional French Neufchâtel and American Neufchâtel. American Neufchâtel cheese is very similar in texture and taste to cream cheese, but is a bit softer and moister, with 1/3 less fat than regular cream cheese. There's really no hard part to making a cheesecake. It just takes some patience. The graham cracker crust may take a few tries to get it level, but you'll quickly get the hang of it. Also, getting the egg whites to the right consistency takes some time — that's why an electric mixer will be your best friend in this adventure. All in all, while your first attempt may not go as well as planned (lumps are still delicious) the more you experiment with different cheeses and flavors, the faster you'll have this culinary favorite under your belt in no time!